Like all of us, you’re busy. Retirement is a fuzzy, distant event that has nothing to do with running the kids to lacrosse practice or to dance lessons while making sure family members with five different schedules can get a semi-healthy dinner into themselves every night. Maybe you’re a professional and are dutifully saving 3% of your salary into a 401(k) every year and getting matched another 3% on top of that by your employer. This is better than most Americans and will fund a retirement in some form, but probably not the one you want. This article shows that saving at least 10% of your income (or more if you’re getting a later start) is what’s required given the increasing likelihood that you’ll live to 85, 90 or possibly even 100. What comes to mind when you hear the word “budget?” Either it feels like an exercise in denial or it feels like a tedious, hours-long exercise of tracking where every single nickel is going in your household. While this may be required if you are in genuine financial crisis, it is not required if you have some money in the bank and are already saving at least a small percentage of your income each month. However, if you’re looking to save more for retirement and get yourself up into that 10-15% range that is required to fund what will likely be a retirement of 30 or more years, I do recommend having a simple spending and saving plan in place to help you get there. I’ve found with my busy clients the plan needs to be easy to set up and able to be maintained in an hour or two per month; otherwise, like many other good intentions, it will get thrown overboard in the daily scramble. This household spending plan will have you off and running in a few hours and can be easily maintained once a month to help you meet your retirement savings goals. If you’re still in your 20’s, consider setting a savings goal of 10% of your income. If you’re in your 30’s or beyond and don’t have a lot saved for retirement, think about how you can get to 15% or more. This may seem a little intimidating, given all the categories of expenses that are competing for your paycheck. If so, rather than setting a final percentage goal (10% or 15%) make a commitment to increase your savings rate by 1% a year until you get to your final target. 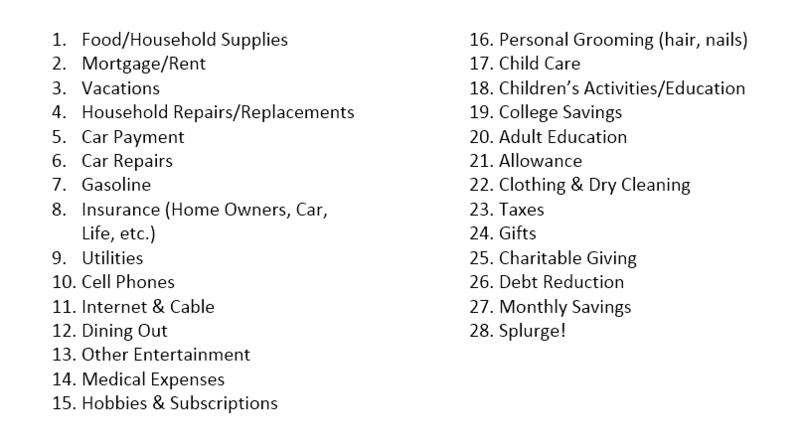 Make a numbered list of all of your household spending categories. Lump things together as appropriate. For example, your heating bill, your power bill and your water bill can be combined under the category “Utilities”. Separate other things that you think should be tracked separately. For example, consider separating “Dining Out” from “Other Entertainment” and “Food/Household Supplies” if you suspect you may be overspending in restaurants. Have no more than about 20-25 categories. Sample budget categories are included at the end of this exercise. Spend NO MORE THAN 10 MINUTES going through your list and making some super rough guesses on how much you spend in each category. Do not get out any old bills, credit card statements or a calculator at this point. Put the spending categories into 3 buckets – big expenses, medium expenses and small expenses. The purpose of these guesses is simply to group expenses into the categories, not to understand where every dollar is going. 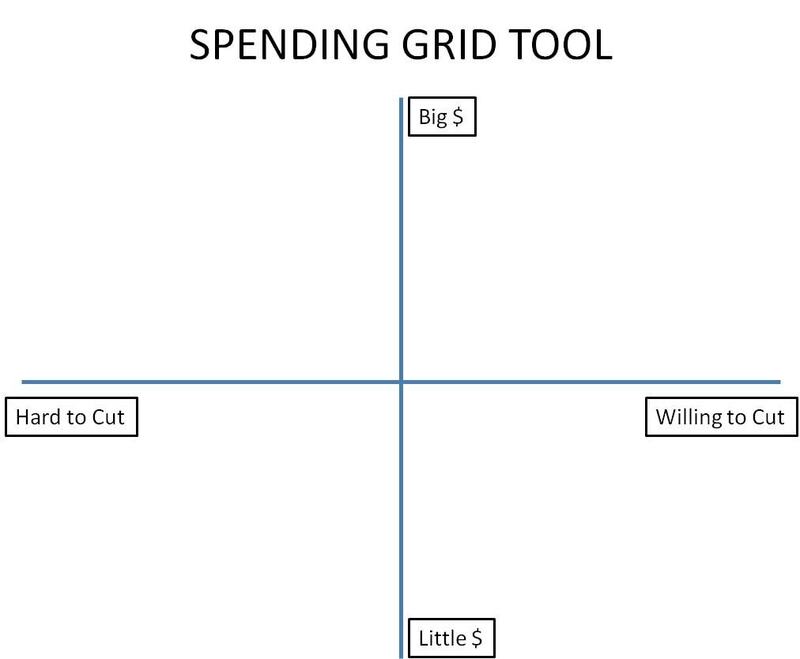 Use the Spending Grid Tool below to help you decide which spending categories you will target for reduced spending. 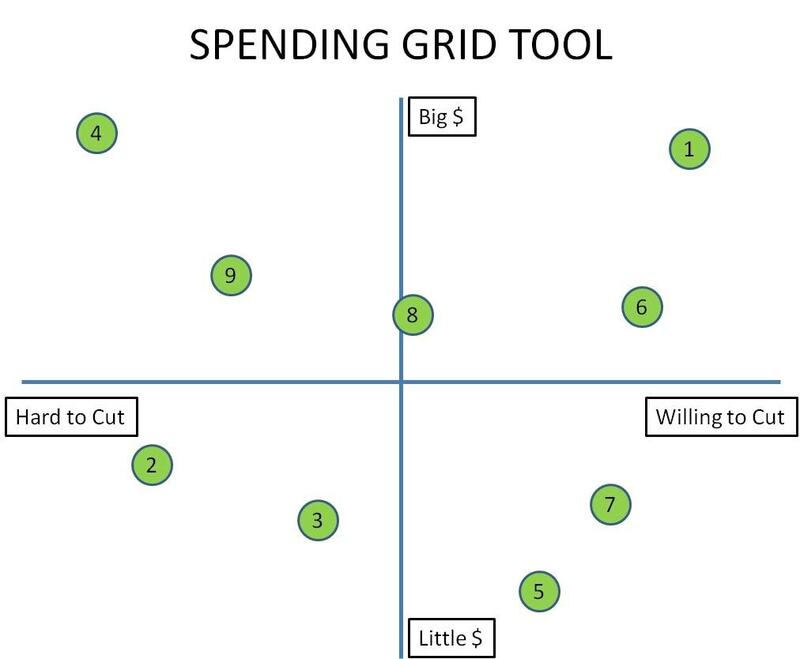 For each numbered spending category, draw an appropriate bubble on the grid. Big expenses should go toward the top of the graph and little ones should go toward the bottom. Similarly, expenses you’d find easier to reduce should go toward the right of the graph while those that would be harder should go toward the left. Consider cutting any categories that fall into the upper right quadrant (that is categories that have a large budget and which you would find easy to cut). An example of this might be the $5 cup of coffee you purchase on the way to work each day. If you switch to most days making coffee at home instead and taking it with you in a travel mug, reducing your coffee purchase to once a week, you could save about $15 a week, or approximately $750 per year, with the same end result of still getting to drink coffee every morning. At the end of the exercise, you should have 1-3 categories that are your Spending Plan Targets for reduction. Now that you’ve identified your 1-3 categories that are your Spending Plan Targets, do a detailed assessment of how much you spend in each. Go back through 3 months of statements and calculate an average for each. Then, figure out how much you need to reduce spending to meet your goal. Have a goal to save 1% more of your income toward retirement this year or $1,000, which translates to $83.33 per month of required savings. Are currently spending $320 per month Dining Out (including those runs to Starbucks) and $250 per month on Clothing. You could target reducing Dining Out by $50 per month and Clothing by $35 per month to meet your $83.33 per month savings goal. This would make your new targets $270 per month for Dining Out and $215 per month for Clothing. When your credit card or other statements come in each month, record how much you actually spent in each of your Spending Plan Target categories. If you’re having no problems staying within the new limits you’ve set over a period of 3 months, then bump up your retirement savings to your new goal. Congratulations! Run the experiment for another 3 months. If it’s still not working after 6 months, consider adding an additional category or 2 to your Spending Plan Target list to get the savings you need. Try the “Cash Envelope” method. Using the numbers above, put $270 into your Dining Out envelope and $250 in your Clothing envelope. Always pay with cash for expenses in these categories. Once the money runs out in the envelope, spend no more in that category for the month. Money left in the envelope at the end of the month can be carried over. 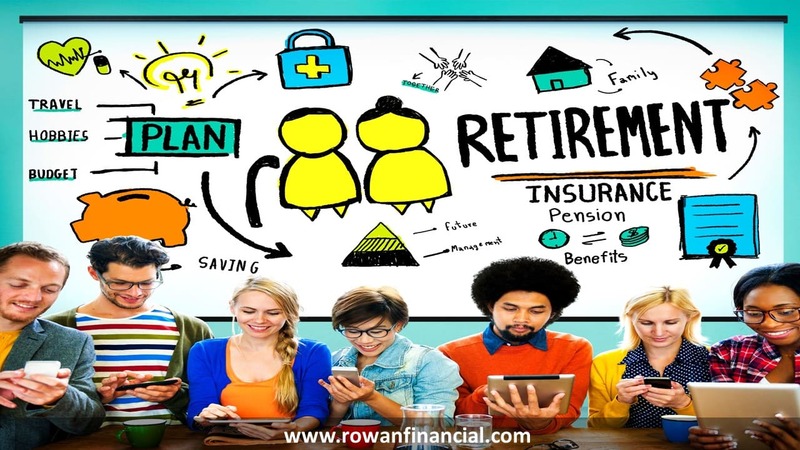 There is no shame with needing to use this approach – I personally know of households with incomes over $100,000 who have successfully used this method to get their spending on track and meet their retirement savings goals. This simple system should take you no more than 2 hours to set up and an hour a month to maintain. It is time well spent to know that you’re meeting your savings goals and are on track for retirement!